And in what manner are they conducting the signature campaign? Dr. Salila, newly appointed head of the Nursing Home, forces the nurses under her to sign the petition without even giving them a chance to read it! She tells them that the Ashram is going to fall, that the Govt will take over the Ashram if they don’t sign, and that their personal belongings and properties will be confiscated!! 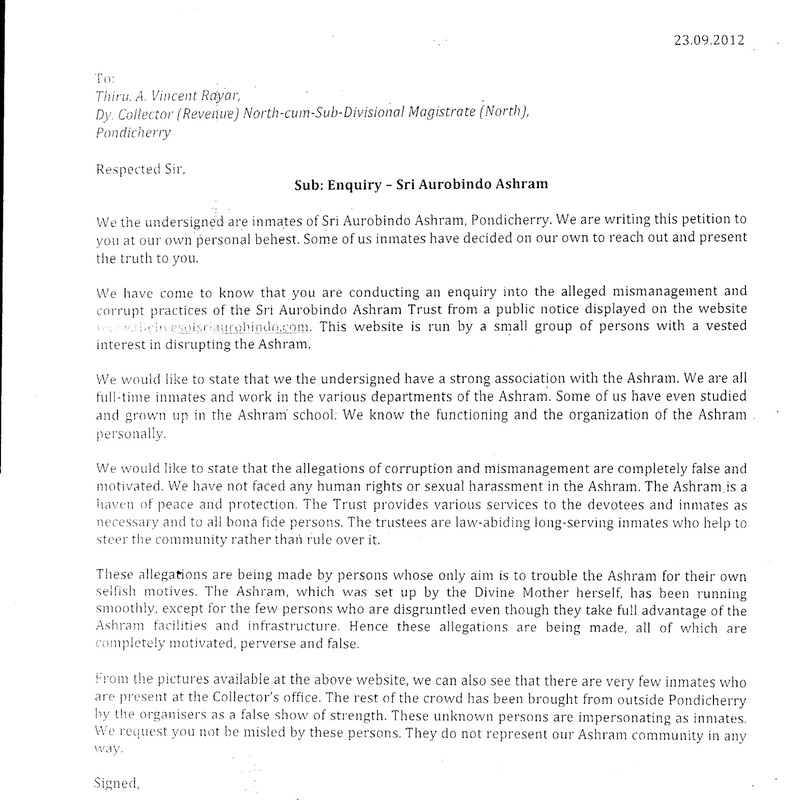 She forcibly wakes up the patients at Care Nursing Home (elderly inmates of the Ashram who cannot take care of themselves) and tells them to sign the petition, “If you don’t sign, we won’t take care of you!” The octogenarians and nonagarians sign out of sheer necessity, coercion and threat! After all, who wants to die of hunger or lack of timely medicine in a nursing home! Elsewhere, unwilling and embarrassed school teachers have been deputed in this “divine service” to go from department to department, house to house, person to person with the same refrain, “The Ashram is going to fall, the Govt is going to take over and the Trustees have to be saved!” Many of the inmates, who know very well the price of being on the wrong side of the Trustees, quietly sign the petition without daring to utter a word against it. For they know that, if they don’t sign, they will be blacklisted by the wily Matriprasad of DisGrace Office, who keeps the devil’s database of all those who oppose him, and will take his revenge in due time in the form of physical violence or denial of essentials such as food or medicine! This is what is going on in all the departments of the Ashram with the explicit instructions and under the close supervision of the Trustees. Of course, tomorrow, when the matter will be raised publicly, they will say, “The inmates on their own, spontaneously, even with a divine inspiration, signed the petition in their earnest desire to save the Trustees. (Oops! Pardon me, the Ashram!) But when will the inmates start distinguishing the Trustees of Sri Aurobindo Ashram from the institution or community called Sri Aurobindo Ashram? When will they realise that the exit of the Ashram Trustees will actually be a boon and blessings to Sri Aurobindo Ashram and all its beneficiaries? Besides how will the signature campaign serve any purpose at all, even from the point of view of the Trustees? 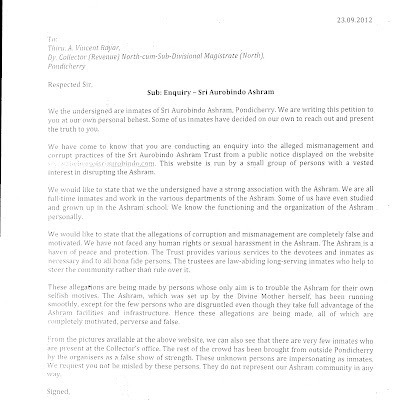 Will the signatures of the inmates exonerate someone from financial misappropriation? or sexual harassment? or human rights violations? Crime is crime whether there is one or ten thousand people supporting the criminal! A crime is decided in a court of law or by a judicial officer, not by the popular ballot! Moreover, criminals are few and their actions are committed on the sly; they have to be investigated in order to catch them red-handed! Finally, how can you take the criminals to task if the authorities themselves are involved, either directly or indirectly by attempting to hide or turning a blind eye towards them, because they happen to be either the friend of the Managing Trustee's girl-friend, or the brother of his friend’s girl-friend, or uncle of his tennis-partner or dancing partner of his favourite actor, and so on? For this is how human mechanics work at the Sri Aurobindo Ashram today! The once “spiritual family” under the Mother’s guidance has unfortunately become a real family with all the evils and limitations of a joint family! Worse still, the elders of this family have no morals or respect for the law of the land and encourage the most heinous crimes in the name of Sri Aurobindo and the Mother! I do not know if the signatories realise the seriousness of the matter in regard to legal and administrative implications. Another unfortunate and demoralizing news. I think the devotees of The Mother and Sri Aurobindo are not prepared to see such frightening things happening in The Ashram under the supervision of the trustees.Fear is a form of Falsehood.If it used to get support of the ashramites it means we are going against principles of The Mother and Sri Aurobindo who came to end the rule of falsehood.